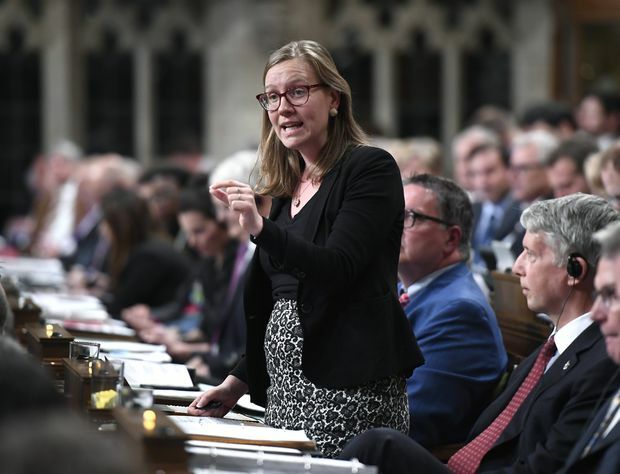 Democratic Institutions Minister Karina Gould rises during Question Period in the House of Commons on Parliament Hill in Ottawa, June 4, 2018. The federal Liberal government will raise the maximum amounts political parties can spend in the run-up to an election after striking a deal with the Opposition Conservatives to allow the government’s election bill to move ahead. The bill’s proposed spending limits during what will be called the “pre-election” period were a major concern of the Conservatives, who generally lead the way when it comes to fundraising and would be in a position to outspend their competitors in the weeks before an election campaign. The Conservatives had attacked the pre-election spending limit as a blatant attempt by the Liberals to tilt the electoral rules in their favour, by limiting the ability of opposition parties to advertise during a period when the governing party continues to have access to government-funded travel and other avenues for self-promotion. Under the agreement between Democratic Institutions Minister Karina Gould and her Conservative Party critic, Stephanie Kusie, the pre-election spending limit would change from $1.5-million to $2-million. The next federal election is scheduled for October, 2019, but the Conservative Party is already running ads to promote party leader Andrew Scheer. Canada’s fixed date election laws schedule a vote for the third Monday in October every four years, though the government retains the power to call an early election. Bill C-76 limits the length of an election campaign to a 50-day maximum and the pre-election period begins on June 30, meaning the pre-election rules roughly cover the months of July and August in the run-up to a fall election. Ms. Kusie praised the arrangement after it was formally read into the record and approved Thursday by the procedure and house affairs committee, which has now agreed to wrap up its review of more than 300 amendments and return the bill to the House of Commons by Oct. 19. In an interview, Ms. Kusie said the deal to end the filibuster and raise the pre-election spending limit was the result of direct and “sincere” negotiations between her and Ms. Gould, the minister responsible for the bill. “I don’t think it’s ideal, but it is an improvement and a step forward in terms of the bill itself,” she said, predicting the changes should now move ahead in time for the 2019 election campaign. The deal caught the NDP by surprise. NDP MP Nathan Cullen said he only learned of the Liberals’ arrangement with the Conservatives in the hallway five minutes before Thursday’s meeting. Mr. Cullen told MPs he would support the deal and expressed hope the other parties would in turn be open to supporting NDP amendments, particularly a proposal that would subject federal political parties to privacy laws. The Chief Electoral Officer and the federal Privacy Commissioner have told the committee they would support such a change, but the minister has not committed to adopt those recommendations.